sarahf (Sarah Frostenson, politics editor): None of us know when the 2020 invisible primary officially began. (Was it the day after the 2016 election? The day after the midterm elections in November? Jan. 1, 2019?) But now that we’re a little over a month into 2019, let’s take a moment to step back and assess the 2020 Democratic presidential field. Who has done well? Who hasn’t? And who do we think will get into the race but hasn’t yet? nrakich (Nathaniel Rakich, elections analyst): The field is definitely coming into focus, which I appreciate. With Amy Klobuchar looking likely to join the race this weekend, I would say that all the top-tier candidates are now officially in except Joe Biden, Bernie Sanders and Beto O’Rourke. And those are the three who can afford to wait, in my opinion, because they already have built-in name recognition and support. Lesser-known names like Cory Booker and Kirsten Gillibrand had to jump in early, which they did. But I think Kamala Harris has had the best launch so far — based on reports about early donations to her campaign, spikes in Google searches of her name, bumps in polling/prediction markets — followed by Elizabeth Warren. natesilver (Nate Silver, editor in chief): Hmm. I probably have a couple of quibbles there. The other quibble is that I’m not sure Beto belongs with the other B’s (Biden and Bernie). Biden and Bernie are unique in that they’re “next-in-line” candidates: the vice president to the most recent Democratic president and the runner-up in the most recent Democratic primary. So they have a unique amount of notoriety and stature, and nobody is going to challenge their credentials. For Beto, it’s sort of the exact opposite. His credentials are a little light. And IMO it reeks of arrogance to take all this time to decide when other, more experienced candidates have already gotten into the race. I don’t think it’s particularly damaging in the long run necessarily, but in terms of someone whose stock has declined, Beto is on that list. nrakich: Sure. We’re probably just drawing the lines between tiers in different places. I would put Beto below Biden and Bernie even though they’re all in the upper tier. sarahf: Yeah, if Beto is in fact running. I agree with Nate that I’m perplexed about why he hasn’t yet thrown his hat in the ring. Although maybe we can expect an answer this month? nrakich: And, yeah, Beto has fallen back into the middle of the pack after seeming to emerge as a front-runner immediately after the 2018 election. But that was probably going to happen anyway — it’s bad to peak too early. And he remains a talented politician when it comes to town halls and fundraising, so it’s not over for him. natesilver: Oh I dunno, Rakich. I think Beto is probably more likely to win the nomination than Bernie. Or maybe not. But you could debate it, at least, so there’s definitely a question. natesilver: In his interview with Oprah, Beto strongly hinted at running but didn’t declare. sarahf: I agree with Nathaniel that Kamala Harris has had the most successful launch so far. Bill Scher over at Politico tried to evaluate how all of the different candidates announcements have gone so far, and while it wasn’t the most rigorous of analyses, I thought his point that she hasn’t yet had to apologize for her past (e.g., her former life as a prosecutor) was spot on. She also planned a media-packed week, which was smart. And that walkback matters — it speaks to questions about her preparedness, policy knowledge and the firmness of her convictions on key issues. natesilver: Here’s a distinction we should probably clarify. When we say a candidate had a good rollout, does that mean they made good tactical decisions? Or does it mean we learned that there’s a market for the candidate but that the market would have existed even if the rollout itself had gone differently? perry: I mean good tactical decisions. For example, I’m skeptical that there is a market for Julian Castro, Gillibrand or Pete Buttigieg, but they had good rollouts. Tulsi Gabbard, on the other hand, did not. nrakich: I would say a good rollout means that the candidate succeeded at tapping into a market that either was or wasn’t there before. natesilver: OK, then maybe I’d argue that tactical decisions don’t necessarily matter that much. nrakich: Yeah, I guess you need both good tactical decisions and some sort of post-rollout sign that it resonated with people. perry: But I think Harris wins the rollout contest because she showed that she has a bigger potential market than Buttigieg does. natesilver: Gillibrand did a lot of things pretty well, but it didn’t seem to move the needle for her in terms of polling or other indicators. sarahf: I’m not sure I know whether tactics or identifying a market matters more. Because for a candidate like Buttigieg to have a good “rollout,” it’s less about tactics and more about locking down a market that is invested in him running. Take Richard Ojeda. He announced in November, after the midterms. I think his rollout was fine, but in the end, he didn’t seem to have a market after all. nrakich: Right. If you’re Ojeda or Gabbard or John Delaney, you need an AWESOME rollout to make a splash. Someone like Harris probably just needed to not screw it up. natesilver: See, I think Buttigieg did have a good rollout, and he was in one of those positions where the tactics may have mattered. He could have been branded as an obscure, third- or fourth-tier candidate, à la Ojeda. Instead, he’s getting a fair amount of facetime on national TV and seems to be taken seriously-ish. perry: So, in my opinion, Warren is the most interesting. She actually jumped into the race early, and her proposal for much higher taxes on wealth over $50 million has captured attention. sarahf: She definitely threw the still-undeclared Sanders campaign into full gear with its own tax plan. perry: But I wonder if Warren’s history of claiming Native American heritage will doom her. The controversy has already spiraled. natesilver: The DNA test that Warren released in October showing she has Native American ancestry was part of her rollout, I would argue. And was an unmitigated disaster. natesilver: Especially since she also made claims about not having used Native American status to gain advantage, which now seem to be more questionable. nrakich: Warren’s best play is to self-opposition-research and dump it all at once, along with a final apology. As one of the more policy-driven candidates, though, she might be able to generate more positive coverage going forward. So it might just be a push-and-a-pull thing. sarahf: It sounds as if you all think there’s a way that Warren can apologize and own her past without sinking her candidacy? perry: It depends on what the apology is. At this point, Warren has to explain clearly: 1. why she was describing herself as American Indian in her 30s and 2. how she knows that universities or employers who were considering hiring her did not take that ancestry into account and therefore hire her in part to add racial diversity to their staffs. nrakich: I think the apology is less important (politically) than making sure no further news can be broken on the topic. You do that by scouring your past and making sure nothing new can come out. natesilver: What time frame is the starting point? Beto’s chances are lower than I would have pegged them a month ago but not necessarily lower than I’d have put them the day after the midterm. Probably higher, in fact. For Warren, it’s sort of the opposite trajectory. The DNA test was a disaster, but the wealth tax and sort of emerging as the most substantive candidate in the field has been good. perry: Warren’s ancestry issue could be her version of Clinton’s 2016 email scandal — an issue that never goes away and maybe gets too much media coverage. sarahf: I don’t know. 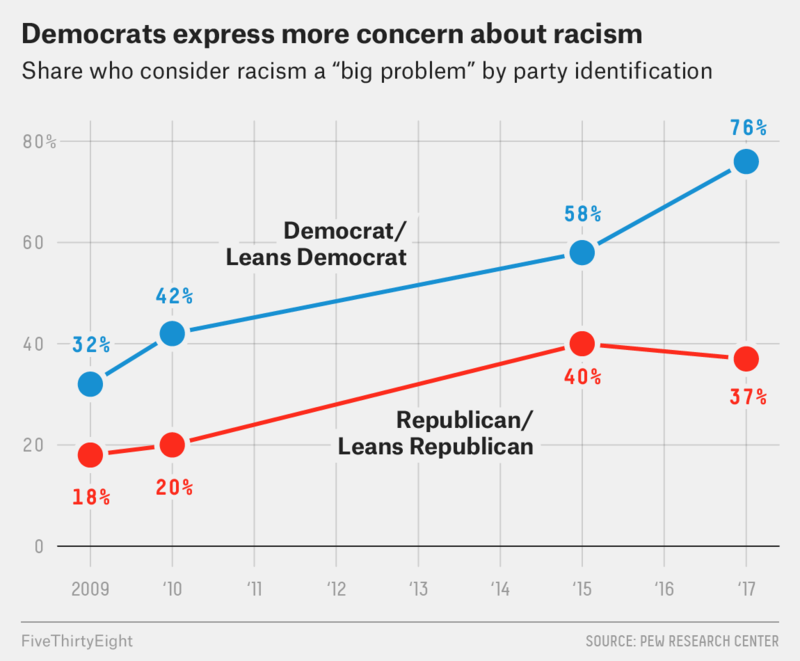 Democrats — and especially white Democrats — are less willing to brush aside issues they perceive as racist. Granted, Virginia Democratic Gov. Ralph Northam, who has been under pressure to resign after a racist photo was found on his page in his 1984 medical school yearbook, is still governor, so maybe things haven’t actually shifted that much. nrakich: But Northam would never win a presidential election. sarahf: OK, we’ve talked about who is running. But who hasn’t announced yet that you’re expecting? And are you already surprised by the size of the field? perry: I wonder whether Georgia’s Stacey Abrams could have been a serious candidate if she had announced before Harris and Booker. I tend to think that the black presidential candidates are competing for black voters and that having too many of them in the field would have hurt all of them. So moving fast and getting into the race early is crucial. And Harris, in particular, has done that. But Abrams is beloved in the party, as you could see last night in the praise she got after doing the Democratic response to the State of the Union address. nrakich: I’m surprised at how the field is already shrinking. I was one of those people who thought the Democratic Party would need to have back-to-back debates to accommodate all the candidates. But you’ve already seen Ojeda drop out and several mid-tier candidates, such as Eric Garcetti and Deval Patrick, decline to run. The field is becoming clearer a lot faster than I thought it would. To me, it’s looking like about a dozen candidates are going to get about 90 percent of the coverage. natesilver: Man I’m just disagreeing with everyone on everything today. I’m surprised at how many people are running, by contrast. natesilver: Usually I disagree with Everyone on Twitter, but not usually with you, Rakich! But you look at Gillibrand and Castro, for instance — those are people who didn’t seem certain to get in and yet they did. nrakich: Maybe this is a difference with our priors. I basically assumed that everyone who was rumored to be interested would end up running. That was probably too hasty on my part. natesilver: Plus, Sherrod Brown and Klobuchar and John Hickenlooper and Jay Inslee are all strongly teasing bids, particularly the first two. perry: There are more senators than I expected and not as many governors or former governors so far, but I think some of those governors — like Terry McAuliffe, Hickenlooper or Inslee — will run. sarahf: The senator phenomenon has also surprised me. I can’t help but think that’s more of a reflection of our politics becoming more nationally focused. nrakich: Part of what we’re seeing is that the Democratic bench of governors is pretty thin. The party got annihilated on the state level in both 2010 and 2014.
natesilver: So let’s say we wind up with 1. Bernie 2. Biden 3. Beto 4. Harris 5. Booker 6. Warren 7. Gillibrand 8. Klobuchar 9. Brown 10. Castro 11. Hickenlooper 12. Inslee 13. Gabbard 14. Buttigieg 15. Delaney. That’s a BIG field. perry: But smaller than the GOP 2016 field, right? nrakich: Yeah, there were roughly 17 GOP candidates covered consistently in 2016. Last year, I definitely would have taken the over on that for Democrats in 2020. But now I think it’ll be the under. Even if, yes, 15 is a big field. natesilver: I mean, it depends on how many also-rans also run! Get a few more randos, and you might be closer to 20 than 15.
perry: Andrew Yang, for example. perry: I kind of expected in the range of 20 candidates. So you guys think Bernie and Biden and Beto did not suffer from delaying? I think they did. Arguably, Biden could have prevented a few candidates from entering (Brown, Klobuchar) if he came out firing on all cylinders on Jan 1. An early run by Beto might have caused some recalculation for Harris or Booker, and Bernie announcing may have influenced Gabbard or Warren. nrakich: It hurts some candidates more than others (thinking again of Biden and Bernie) to delay. I do think Hickenlooper and Brown are probably blowing it. If they’re interested, they needed to have gotten in yesterday. perry: Brown is in a lane that is somewhat unoccupied (white male from a swing state), so I think he is fine. But, yes, Hicklenlooper and Inslee should have announced yesterday. natesilver: Biden probably has enough stature that if people had been intimidated by him, they would have avoided running, even if Biden hadn’t officially declared. perry: So you are saying Biden is a weak candidate? natesilver: Brown and Klobuchar considering a bid is a bearish sign for Biden. All three are riding on an electability argument, I think. nrakich: People have been buzzing about Klobuchar for a while, though, whereas Brown may be seen as a substitute for Biden. That said, his “listening tour” is probably an acknowledgment of the fact that he needs to do SOMETHING to keep himself relevant while he awaits Biden’s decision. natesilver: Maybe the true-blue moderates have been deterred by Biden — e.g., Michael Bloomberg and McAuliffe — but I’m not optimistic about any of their chances. sarahf: And is that because we think the 2020 Democratic nominee is going to come from a more progressive wing of the party? nrakich: I’m not sure. I think if it were an open fight between the progressive wing and the moderate wing (I hate that dichotomy, I need a shower having used it), the progressive wing would win. But the moderate “lane” (ugh I hate lane analysis too) looks wide open right now. Who is in there among the declared candidates? Just Delaney, I guess? So if it’s Biden vs. a dozen progressives, I’d take Biden. natesilver: Sarah, the left is obviously on the upswing, but the conventional wisdom may have actually begun to overcompensate, in part because a lot of commentators on Twitter/podcasts/etc. are further left of center than the average Democratic voter. Like, I don’t think there’s any world in which Kamala Harris doesn’t win the nomination because she isn’t left enough. nrakich: Right. Nonwhite voters, especially among older generations, aren’t super lefty. And they are often underrepresented in the media relative to their share of the electorate. perry: We will have more on this on the site later this week, but I tend to think that dividing Democratic voters and candidates by whether they are anti-establishment or establishment is just as meaningful as grouping them as white or nonwhite. And maybe even more telling than the progressive v. moderate distinction. As Nathaniel is saying, we often assume that moderate Democrat means a white person with the politics of Howard Schultz, but lots of moderate Democratic voters are black or Latino. And I don’t see much evidence that Klobuchar will be the candidate for those voters — or at least she has not had to do well with them to win in Minnesota. nrakich: We’ve talked a lot about entertaining multiple hypotheses about how the Democratic primaries could go. So, one possibility is that they could unfold along identity lines. They could also unfold along ideological lines (progressive vs. moderate). But they could unfold along establishment/anti-establishment lines. But if all these things intersect, which looks likely, they will do so in unpredictable ways, so to some extent, we’re all just guessing here at the right alchemy. perry: I think Harris or Booker could be the candidate for minority voters and establishment voters even though they would call themselves progressive. And then Sanders or Brown may appeal to white voters and anti-establishment voters, some of whom would also call themselves progressive. natesilver: You also have Beto, who sort of comes across as new and fresh and “anti-establishment” but is also supported by a lot of ex-Obama types (i.e., people who are very much a part of the establishment). nrakich: Yeah, the generational divide is another possible fault line. natesilver: To some extent, the talented politicians are able to come across like the best of all possible worlds to all possible voters. In various ways, Obama both ran to Hillary Clinton’s left and to the center (as a “post-partisan” candidate) in 2008, for example. natesilver: Rakich, what the hell kind of pun was that? perry: It was special. Do not cut! sarahf: If you have made it this far, reader, let me know if you regret it. natesilver: This is why we don’t let you write your own headlines. nrakich: I was so tempted to write that Joe was Biden his time earlier. sarahf: On that note, it’s time for final thoughts. What are we watching for in February? nrakich: Well, Beto told us this week that he’ll make a decision about running by the end of February, so that’s a big domino that could fall. And then I’m curious to see how long Sanders and Biden think they can stall. perry: I’m curious whether Klobuchar, Beto, Biden, Sanders, Hicklenlooper or Inslee announce and how they decided to roll out their campaigns. Another thing I’ll be keeping an eye on is who among the already declared candidates keeps getting attention. There is definitely a buzz factor in these primaries — who can get it and maintain it. nrakich: With so many B’s in the field, how can there not be a buzz factor? sarahf: It certainly is a kicker.